A Lagos couple, Mr Michael and Mrs Roseline Oaikhena, have been denied the custody of their newborn baby, Ighodalo, for three months over an unpaid medical bill of N650,000. 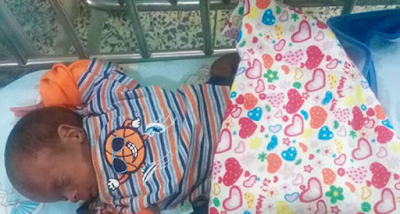 Punch Metro learnt that the hospital holding on to the child, Inton Hospital, Ogba, Ikeja, Lagos, had allegedly vowed to put him in an orphanage unless the debt was cleared. Punch correspondent gathered that Roseline, a private primary school teacher, had given birth to a set of twins on February 10, 2018, at the Ifako General Hospital, Lagos. The babies, which were premature, were reportedly taken to Inton, where they were put in an incubator at the rate of N300,000 per week. After one week, the female child reportedly died, while the surviving boy continued treatment at the intensive care unit of the facility at the rate of N150,000 per week. The child’s father, Michael, a driver, said the bill later rose to N1.2m. He said, “My wife and I have been married for about two years. When she conceived, she went through a lot of stress due to the nature of her job and at a point, a doctor advised her to go for bed rest. “She gave birth at the Ifako General Hospital when the pregnancy was about six months. We were unable to get an incubator at the hospital and our search for one in Lagos public hospitals proved abortive. “She gave birth around 1pm and when we could not find any public hospital with an incubator, we settled for Inton Hospital. We got there around 11pm; their bill was N300,000 per week. He explained that the mother had been visiting the hospital to give the newborn baby food, adding that the child was being held over the N650,000 medical bill that the family owed. The wife, Roseline, expressed sadness that her baby could be taken to an orphanage while she was alive. The 28-year-old noted that efforts by the family to raise funds through social media had been abortive, adding that she lived in pain every day. She said, “I was going to see him at the hospital every day before I stopped because of transport cost. I go twice a week now. “The hospital said the next step is to take him to a motherless babies’ home because we don’t have money. A doctor at the Inton Hospital, Dr. Badejo Christopher, had said the medical bill was high due to the specialised care required by the baby. Christopher, who spoke to The PUNCH in March while the baby was still receiving intensive care, said Ighodalo was being monitored by a consultant paediatrician. He had said, “The mother went into labour at 27 weeks as against 38/40 weeks. The twins were rushed here, but we could not save one of them. The boy has been inside an incubator and taking drugs. The Chief Medical Director of Inton, Mr. Akeem Mustapha, on Tuesday, however, denied that the hospital planned to take the child to an orphanage, saying the couple wanted to draw public sympathy. He said, “There is nothing like that. We only advised them that it is not right to put the child in the nursery for a long time because if any infection breaks out at the hospital, the child may be affected. Nobody will say because of that, the child should be taken to a motherless babies’ home. Why? When Punch Metro asked if the hospital could release the baby on compassionate grounds while the parents amortised the debt, Mustapha said our correspondent should pay the bill. “The ones that had been paid were by instalments. You can lend them the money and they will pay you back later. Tell your company to pay on their behalf; they will pay you back by instalments,” he added.